Meg Mabry has spent her life trying to ignore her family legacy - a set of journals penned by her great-grandmother, Hannah Bass. The volumes describe her life on the Southwestern frontier as she arrives in Las Vegas, New Mexico, works as a Harvey Girl at the famous Montezuma Hotel, marries, and becomes an early preservationist of Pecos ruins. So detailed are the diaries that they have become Southwest treasures, read and studied by school children and university students alike. Meg, however, wants nothing to do with them. She has spent her childhood crammed into her grandmother, Bassie's, spare room with the journals, vying with them for Bassie's attention. And losing. As Bassie's caretaker, an adult Meg puts up with her cranky, critical ways, but she will not bow to her grandmother's constant plea to read the journals. Now, Bassie has learned that a team of archaeologists plans to build a new addition to the visitor's center that sits near Hannah's original homesite, an addition that would encroach upon land her parents used as a cemetery for their precious dogs. Immediately, Bassie demands to be taken to New Mexico to protest the excavation. Although Meg is busy with her own life, she knows there is no way to get out of the trip, so she reluctantly travels with her grandmother. Once in Las Vegas, the power of the past seems unavoidable. Drawn to the journals she previously shunned, Meg finds herself riveted by Hannah's story. Meanwhile, Jim, a handsome archaeologist unearths disturbing artifacts at the home site, discoveries that signal something much more sinister than a dog's grave. The elusive answers to Hannah's mysteries seem to lie in a missing volume of her famous journals. As Meg and Jim probe the depths of the past, Meg finally starts to come to terms with her grandmother and her whole, sordid, incredible family legacy. 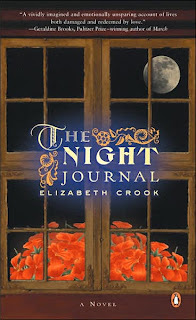 While The Night Journal starts out slowly, it picks up as soon as Meg begins reading Hannah's story. Once that happens, the book becomes an exciting adventure into a past full of secrets and lies. Hannah's story about life on the frontier is riveting, with enough period detail to make it interesting and believable. The story does tend to drag in places, but all in all, it's an engrossing read. You may find yourself slogging through the beginning, but stick with it. You'll be glad you did. That ones sounds interesting. It combines history, archeology, and mystery writing, all things that I enjoy. Thanks for the review.